Billionaire Peter Thiel speaks at The Economist's Buttonwood Gathering Tuesday in New York. Stop blaming technology for all of society's problems. That's what billionaire venture capitalist Peter Thiel wants. The co-founder of PayPal and early backer of Facebook (FB) dismissed claims that super smart machines pose an imminent threat to American workers. "Middle class jobs in the U.S. are not threatened by artificially-intelligent robots. That's like science fiction. 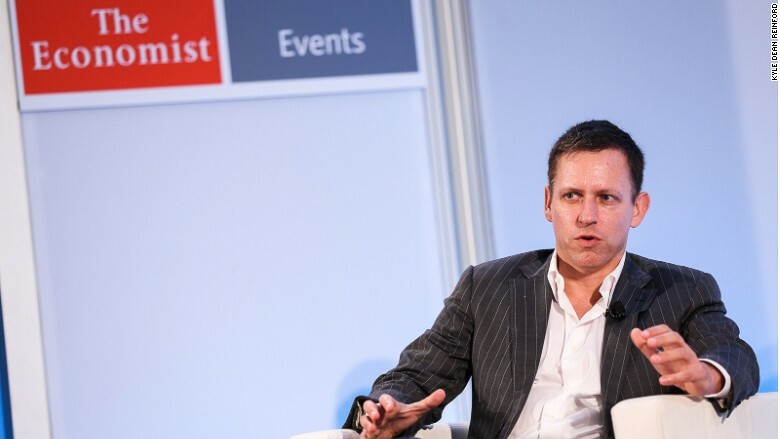 It might happen in 100 years, maybe never," Thiel said on Tuesday at The Economist's Buttonwood Gathering. The Silicon Valley entrepreneur characterized these fears about technology as shortsighted and tired, having been around for over 200 years. "It's a problem we would like to have...It would free people up to do far more productive things," said Thiel, who recently invested in a marijuana startup. He alluded to the dramatic increase in productivity and living standards created by innovations like the assembly line during the Second Industrial Revolution that began in the 1870s. Blame globalization: Today's middle class jobs are threatened by globalization, not technology, Thiel said. He was referring to the millions of U.S. jobs that in recent decades have been shipped overseas to countries like China and India, whose workers require vastly cheaper wages. "I'm not against globalization, but we should be very clear that that's the force of pressure on the middle class. It's not this scapegoat called technology," said Thiel. Beyond the impact on jobs, Thiel doesn't sound nearly as worried about artificial intelligence as Tesla (TSLA) founder Elon Musk, who recently said AI poses a grave threat to the human race. "I think our intuitions about it are very poorly formed. My sense is that it's still much further into the future [than people realize]," he said. Reform the FDA? Like others in Silicon Valley, Thiel is frustrated over the role of government regulation of technology. Thiel pointed specifically to the strict oversight of new drugs by the Food and Drug Administration, the government body charged with protecting people from taking dangerous medicines that don't work. He argued there needs to be more experimentation and less tight control in this area, especially in terminal cases. Not only is the government stifling technology, Thiel argued it's declined as a driver of innovation. He said landmark projects of last century like the Apollo space program and the Manhattan Project wouldn't even be possible today. "If Einstein sent a letter to the White House, it'd get lost in the mailroom," he said.